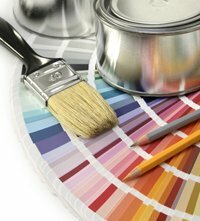 Choosing wall paint colors is no little thing - you have to order large amounts of paint, and your new paint colors will have a big visual impact. With the right colors, you'll have a background tat sets the mood, and makes your furniture and carpeting come out on its best. Good wall colors are in the background, you don't notice them consciously all the time - unless there's something wrong. Here are some tips and techniques to get you going. 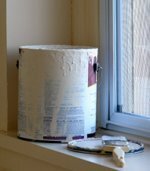 If you don't have much daylight (and like to make the most of what's there), use white paint. But: dark colors can also give a spacious feeling - with the help of good lighting, focal points are created, and the darkness behind it envelops the whole. In general: small rooms are better off with lighter colors. There's a defenite relation between color and mood, and even between color and health. When you like stronger wall colors: use slightly different colors for each wall to play with the light, or make an accent wall. The accent wall indicates the focus of your room. 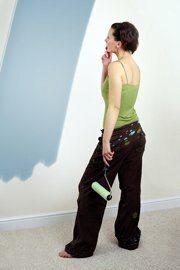 If you wall color is too strong or chemical: tone them, by adding bits of color. 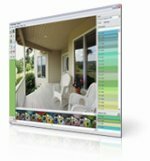 Especially when planning on stronger wall colors: the use of house paint software might be helpful. It gives a realistic preview on the results. Don't rely on small chips or screen colors: order sample jars to try colors out. 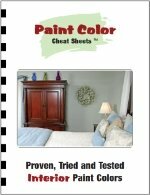 If you're not sure: the Paint Color Cheat Sheets give you something to hold on to. 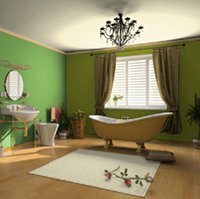 It contains a list of wall paint colors that have proven themselves over the years. Click here for a review. 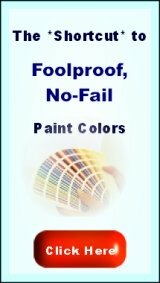 Once you've decided on colors, you can order your chosen colors (of any brand) at ThePaintStore.com -but first check them with the help of interior paint samples. When you'll use a primer, think of ordering a colored primer as well, it saves you an extra paint layer (and thus: time and money). Wall colors make huge visual surfaces, that's why it's good when they're toned or shaded. Toned means: having bits of color added to them. If you're a bit adventurous, and don't like the color you bought because it's too onesided: add colors to it to make the color more subtle. You can either do that to adjust the colors to your daylight, or to harmonize the colors to other colors in the room. If for example your orange paint doesn't look good with a blue couch: add some paint of the same color blue to the orange, and they'll look good together. Click here for more color adjustment tips. A sample jar will be enough for adjustments like this. Stencils are a good way to make regular wall decorations. Fill them with colors that are already in the room, and first make a scetch. If your colors are modest, the shapes can be wilder. If your painted walls have straight edges, and modest colors, even abstract-expressionistic wild gestures look modest. If you have to do a primer: think of doing a faux finishing project. Choose a different primer color, and brush over that with a slightly thinned paint. If the edges are straight, and your gestures regular, it will always look good. click here for tips on underlying paint colors . When making a design: match the colors, the stencil pattern into a bouquet, along with all the other styling elements in your room. 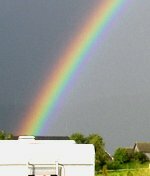 In acrylic latex, you can order any color you want - as long as you have a paint color name or number. If you want to work with milk paint, you'll have to do your own color mixing. But soon, the order-by-number service will also be available for sustainable paint. I'll keep you posted on that. 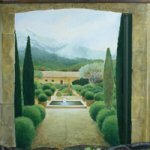 Check here for making egg tempera paint, and here for more on non-toxic paint.